This book began with a quilt. Actually, that's not true. It began with a nursery rhyme which is probably as old as quilting itself, but for my purposes, before I had any idea of using the rhyme in a book, I made the quilt. In 2006 my local quilt guild, Pacific Piecemakers, celebrated it's tenth anniversary by holding a "Challenge Show" with the theme, "The Perfect Ten". Each member was to make a quilt using the number 10 in some way; 10 colors, 10 quilt blocks, 10 fabrics, ten objects...etc.. I had been a member for a couple years, but being busy on my books, had not yet participated in a "challenge". This year, with no book deadlines looming, it seemed a good time to jump in, but what could I do? I considered a number of ideas, but nothing seemed just right. Then my mother--whatever would I do without her?--suggested that I use the nursery rhyme, "1, 2 Buckle My Shoe". Great idea! 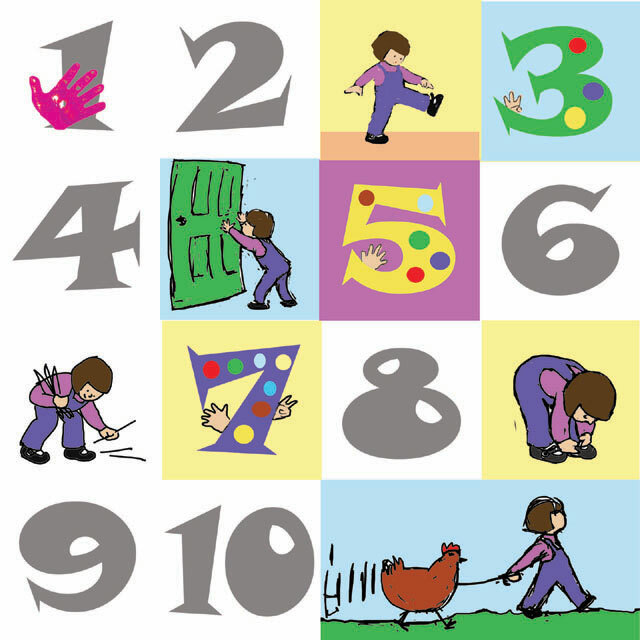 I would do the numbers from 1 to 10, along with picture blocks to illustrate the rhyme. I thought about using buttons and hands with fingers for counting. Excited by the opportunity to use some of the fancy stitches on the sewing machine I bought to finish the PIECES quilts, I created the quilt with lots of bright colors and trimmed it with buttons and rick-rack. The hands didn't work out, but the buttons were great fun. 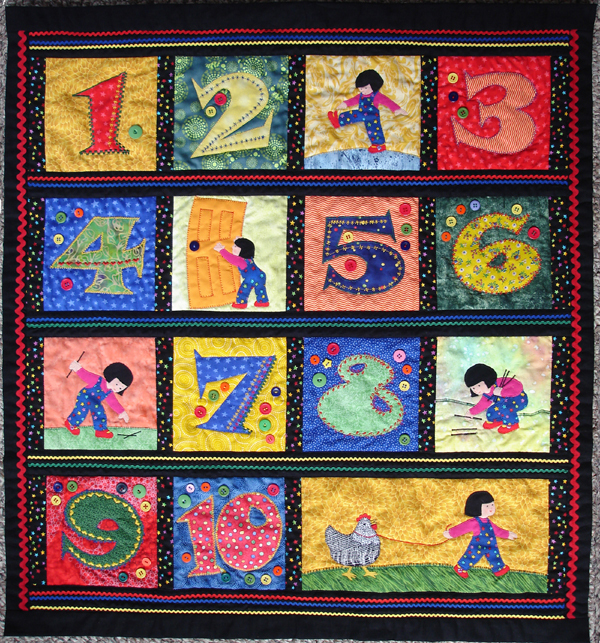 The number and picture blocks are 6 inches square, and the over-all dimensions of the quilt about 33 by 33 inches. 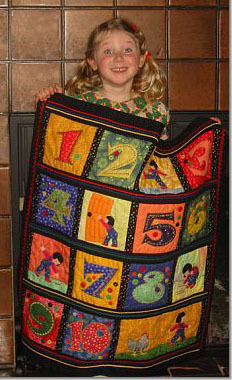 Once the quilt had served it's purpose in the show, I gave it to my then two-year old granddaughter, Violet Grace. It was spring and I hung it on their fireplace screen, temporarily I thought, but Violet insisted that's where it went and refused to allow it to be removed until winter arrived and it had to go so they could have a fire. Meanwhile, several of her young friends visited and enjoyed counting the buttons and reciting the rhyme with her. Their enjoyment prompted my daughter Sarah to say, "Mom, that's a picture book." Violet still loves her "chicken quilt", and though she did let me borrow it for a time while I was working on the book, now has it hanging in her room. When I showed her my first copy of the book she got a rather alarmed look on her face, hugged the book up, and ran to her room to make sure her own quilt was still there. 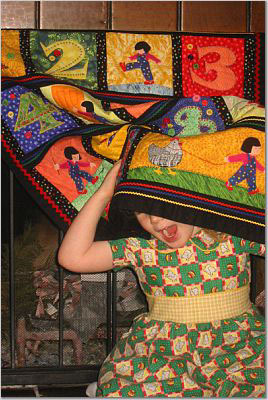 Here are a couple of pictures of Violet, soon to be four, clowning with her "chicken quilt." How did the quilt become the book? Click here to see the process, step by step. Seven Impossible Things Before Breakfast: Read a review on a fascinating blog about books by librarians Eisha and Jules.